NEWKON Embosser 60 - Technology Unlimited, Inc.Technology Unlimited, Inc. The NewKon Model 60 is the most safe, economical and easy-to-use manual embosser on the market today. The extra long handle provides a smooth embossing action, which will lessen the possibility of a carpal tunnel injury. This tabletop unit is both compact and portable. 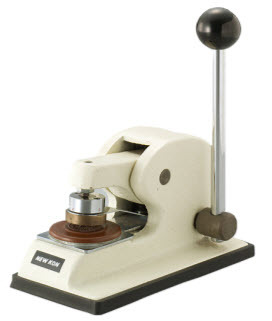 This embosser will prevent possible alterations or forgeries of all your important documents.